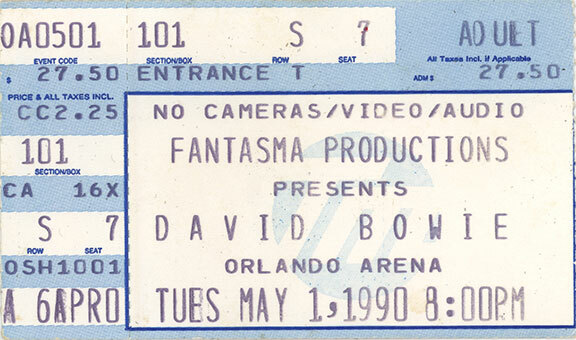 May 1st, 1990 was the first time that I saw David Bowie live. He was actually coming to Orlando, Florida, so I did not have to take any road trips this single time. The tour was interesting to me since he had chosen Adrian Belew as his lead guitarist for the first time ever. While Adrian had played lead guitar on “Lodger,” that was an album where there was no tour. So this already had a certain cachet with me going into it. The second, and possibly most significant thing about the tour was the stated intention to “retire” large [and popular] parts of his back catalogue, in order to make a clean break moving forward. So this tour had a valedictory feel to it. On one hand, all of the 80s material that I was down on would go away, but on the other hand, material like “Rebel Rebel” which was old, popular, and [more importantly] good, would also get shelved. Well, we had to take the rough with the smooth this time, so I eagerly bought my ticket. The concert was fine. The staging was impressive with the large Orlando Arena used as a broad canvas with which to paint the presentation. The five piece band was small and tight. The arrangements were clean and simple. The main visual factor that added that necessary Bowie “wow” factor was a huge scrim that would raise and lower during the set with midi-synchronized video projections of a 3-4 story Bowie harmonizing backing vocals against the main body of players at various times throughout the concert. At other times, footage of Bowie dancing with the members of the La La La Human Steps troupe [Edouárd Locke, their choreographer was creative director for this tour] would fill the skies of the arena at a huge scale. The setlist had a mixture of old and new Bowie with most of the setlist skewed to the 70s, naturally. There were some great songs played and only a few duds to my ears, but the whole exercise had a canned air due to the synch issues with the video. While it was stunning in delivery enough; Bowie singing in harmony with a 80 foot version of himself standing in the air behind him is nothing if not impressive – it meant that every note had to be perfectly planned and timed to the split second. It absolutely sucked any spontaneity out of the show for the most part. The one surprise came courtesy of guitarist Belew. It was a nice break in the set when Bowie had Belew join him in a duet for new single that would be released a few weeks later on Belew’s “Young Lions” album. 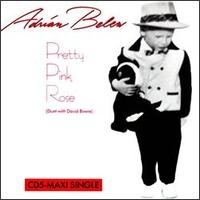 “Pretty Pink Rose” was a fairly decent number with a breezy but interesting feel to it. I sort of felt like “Time Will Crawl,” which I always maintained was a decent song from a terrible album. The lyrics were absolutely the work of Bowie. I bought the CD5 a few weeks later on its release. At the tour, I bought the tourbook, a glossy thing notable only for having the lyrics to the songs played printed on its pages. I was not yet ready to wear tour shirts in 1990, so I skipped that bit of merch. After attending this concert, it lit a Bowie fire that resulted in me doing something that I never would have imagined prior to it. 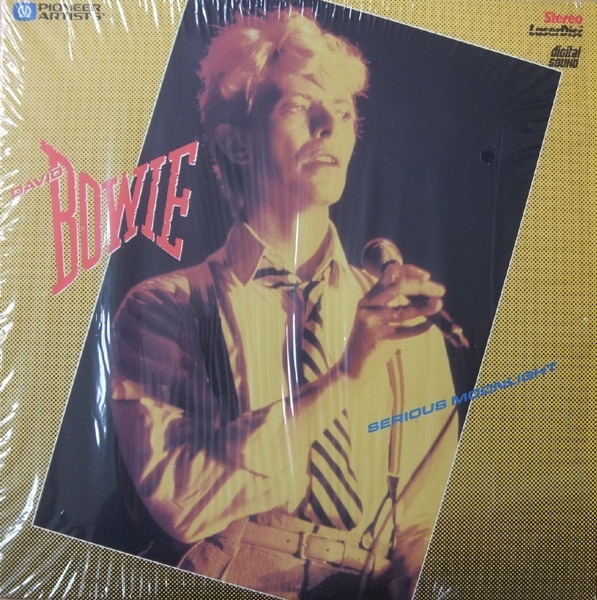 Hungry for more live Bowie, I went to Camelot Music and bought the “Serious Moonlight” laserdisc. This managed to both assuage my hunger for more and make me glad that I had not seen the tour, back in the day. The song list was fairly great. In fact, it came close to being the Sound + Vision tour set list, in all candor! The 1984 tour often featured superb songs rendered in the most ghastly and appalling fashion possible. “Stationtostation” as a breezy five minute romp just missed the point entirely. Tellingly, the material that came across as the least affected by the performance were songs from “Young Americans.” These sounded as natural as could be imagined, nearly ten years later. It was his more interesting material that was ill-served by this romp through the stadiums of the world. 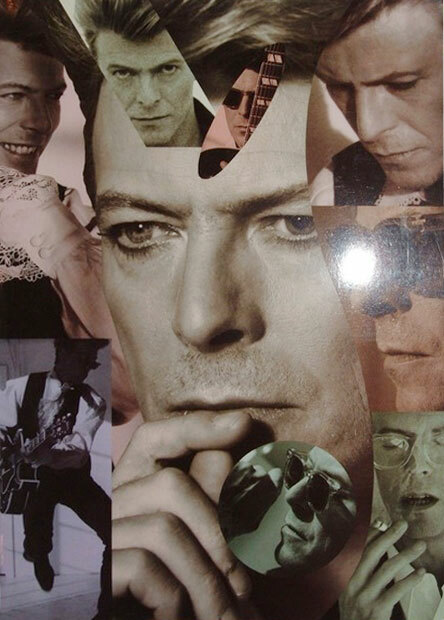 It all served as a grim reminder of the cost that chasing sales and popularity took upon Bowie. This entry was posted in Bowie, Core Collection and tagged 1990, Bowie, laserdisc, Live Concerts, Serious Moonlight. Bookmark the permalink. Bowie at Giants Stadium in NJ twice in 3 years. That should be a great thing, but it wasn’t really. The Sound + Vision Tour was really good and it was nice that the staging was less po-faced than Glass Spider, but something went wrong that tour for me. It was too big, too impersonal. I was also much too sarcastic in mood. I wore a t-shirt I bought from NME begging Bowie to “Play The Laughing Gnome” as he had some sort of write in contest to add songs to the set list that punters would want to hear. This managed to get me on one of the local news broadcasts, but, no he didn’t go near that song. I remember wondering if this was it for my need to see Bowie live anymore. Could Bowie be vital again onstage? I would see him again, but little did I know how much better I would feel about it at that point in 1990. Echorich – Yeah, the Sound + Vision tour was almost a dud for me. It had a perfunctory air that may have come down to it’s anticlimactic feel after a decade of diminished Bowie art. The scope of the staging was such that a home video of if would not have made sense at all. It was too large to play on the tube. To try would be missing the point of it all. There was certainly NOTHING intimate about it, but Bowie did take a page out of his pal Jagger’s book and did a few nightclub gigs before some of the big shows. In NYC he played The Cat Club and I was able to blag my way in for the last few songs. It was a great vibe, but I must admit I don’t remember the music very much. I have read elsewhere that he really didn’t enjoy live performing that much, and certainly would have enjoyed it even less so on the arena circuit. I think he was quite capable of having a good time doing the smaller gigs, but that’s not how you make the money needed to support the costs of touring. I liked the projections, but where I was at that same show I could see Bowie going for a smoke break EVERY MINUTE he was not required on stage. But when the projections worked, the worked well, and the setlist was well-chosen. chasinvictoria – I had forgotten about the Frequent Smoke Breaks. Paging Pete Burns to the white courtesy phone! 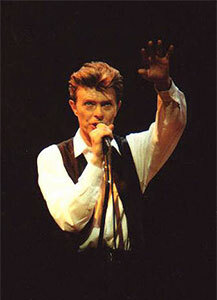 Of course, we would see Bowie again under differing circumstances each time, with unique results.